Martha Munizzi talks about her personal likes, recess from recording & passion for pastoring. One of the principal Praise & Worship artists of the millennial generation, with credentials for crossing cultural lines is Martha Munizzi. Her fervent voice and enduring anthems are a part of her artistic ID. Immortal songs like Because Of Who You Are, God Is Here & Glorious (both made even more popular by Karen Clark Sheard) are songs that have stood the test of time. Martha is unlike any artist in Contemporary Christian music today, which is perhaps part of her unique appeal. Her prolonged absence from the artistic stage was cause for concern. 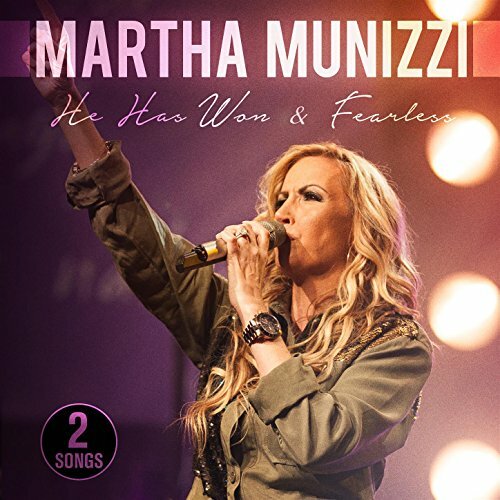 Fortunately for her fans and faith-based music lovers, Martha has returned to the recording studio in 2017 and released two solid songs worthy of a worshiper’s repertoire, Fearless & He Has Won, as teasers to a much anticipated album on the horizon. BlackGospel.com spoke with this noble woman of God about her personal likes, her recess from recording and her passion for pastoring. Christopher Heron: Martha, are there albums that really captivated your heart, your attention in 2016? Martha Munizzi: My good friend David & Nicole Binion released a record. It has beautiful songs and great music. I also enjoyed Israel Houghton & New Breed, which was truly groundbreaking. I love Hillsong too. I just love what God is doing in worship through music. Christopher Heron: What’s one thing that best defines your Florida roots? Is it your love for the beaches or theme parks? Martha Munizzi: Well, I would say the beaches. The beaches are what calls me, it’s what draws me, I want to live there, I don’t ever want to leave the beach. It’s so beautiful. I love living in Florida because we’re so close to the Coast so anytime we need to, we just jump in the car and we’re there. We love it. Our whole family lives at the beach. It’s so healing. I just love watching the waves, just lap up on the shore. Even if we don’t get in the water, there’s just something humbling about it. It’s powerful. It’s probably one of the best places to be creative. Christopher Heron: And since you live at Heaven’s door steps in Florida, what is your favorite getaway spot in the whole wide world? Martha Munizzi: That’s a good one. I’ve been to Hawaii a couple of times, and I have to say there’s nothing like it. We’ve also been to the Virgin Islands, just anything that has a beach and a couple of mountains. Christopher Heron: Let’s talk about your music and ministry for a minute. It’s good to know that you’re finally returning to the forefront after a 6-year hiatus. Why has it been so long since Make It Loud? Martha Munizzi: I’ve asked myself that question too. Why did I wait so long? The real answer is that the last 6 years my kids really needed my attention. It was an important season for me to be home. With a new record, it takes so much time and energy. And it’s all great, but I just felt like I’ve done that for so many years. I just follow what the Holy Spirit leads me to do and if I feel an anointing for it or if I feel like there’s something I need to say or God has given me songs that I need to write, then I’ll do it. It was a season my kids needed me to be connected to them. They’re kids going into their early 20’s and it’s a very developmental season for them. My kids were developing their music ministries and getting involved in church, so I just jumped back in the local church and made sure my kids were where they needed to be. Christopher Heron: What about your church ministry you’re excited about, Epic Life? Martha Munizzi: Just serving as a Youth Pastor in recent years planted a seed in my heart and my husband was like, ‘’Okay, there’s something more here.’’ That calling just grew and began to talk to leaders, and family members and we were feeling this calling on our hearts and people said, ‘’It sounds like God’s calling you to pastor.’’ We know how hard that responsibility can be. You don’t just take the title pastor, you better be called, or it will crush you. It’s just not for the faint of heart. So we just kept praying for several years. David Binion, who’s a very good friend of ours, prophesied on my husband and I and said, ‘’God has put a church in you, and you better be obedient.’’ So we knew right then what was next, and we just started building a Dream Team for about 2 years before we launched Epic Life. We’re going to celebrate 2 years in September, and it’s been the best season of our lives. It’s really been incredible. Christopher Heron: So how has that aspect of being not only a worship leader but now a First Lady impacted you personally, spiritually, and artistically? Martha Munizzi: It’s impacted me in a lot of ways because I’m seeing some things from the pastoral perspective. I believe worship leaders have a pastor’s heart. And I’ve always had a pastor’s heart. My dad was a pastor, my parents pastored for years, and my extended family is loaded with pastors, so I understand it. My husband grew up in church. His dad was a worship leader, so it’s been a process of preparation, but when you’re in it, you’re doing it. You’ve put the label ‘I’m a pastor now. Come and let me pastor you.’ You’re prepared as much as you can be. We’re not as conventional as other churches. I’m the main communicator; it’s what we call it. I do all the speaking on Sundays. My husband is very visible, he’s more administrative. He’ll get up and exhort people, but he knows that my gift is speaking and so we don’t compete. It has really worked out well. He runs all of our men’s ministries, our connect groups and does a great job. He’s so great. I just bring the Word on Sunday and so far it’s working out great. We’re seeing that model over and over in the body of Christ. Women are stepping into a whole new forefront which is exciting. My music even shifted. I went through a dark season before we said yes to pastoring. I didn’t know what God was saying, but I just had this pull in my spirit. I literally heard voices crying out to me. I really did. I would be on vacation, and I would be in a depression. I could not be happy because I knew there was something God had called us to. It was bigger than what we were doing, and I was afraid to say that it was pastoring. I was just really afraid of it, but when we finally said Yes, the clouds lifted. I’ve heard many pastors say that right before God called them to the biggest parts of their ministries, they went through a dark season. It was in that dark season when God just embedded in me thoughts and ideas that have become songs. I like to write songs that are organic, and authentic. I don’t like to sit down and say, ‘’Hey, let’s come up with a cool song.’’ The best time is when, in the deepest part of your heart, God is speaking to you. And that’s how these songs were written. Christopher Heron: How do you account for the growing popularity for Worship music? Martha Munizzi: Another great question. I believe there’s a hunger for God’s presence. We can’t just keep experiencing the same religious experiences that really aren’t creating a change in our hearts. What I’m finding is that God is raising up prophets that are songwriters, pastors and leaders. I think we live in the day when there’s a call to action, and people are ready for it. They’re saying, ‘’Just tell me, show me, lead me. How do I get in His presence?’’ There’s a hunger that I didn’t see growing up in America. You see it in other countries, but I feel as if we’re seeing it more and more today, there’s a stirring and a hunger of God’s presence. I think one of the reasons why that’s happening is because there are so many sources for people to feed on today. If you wanted to feel hungry in the natural sense, the first thing that you would do is starve yourself, but in the Kingdom, it’s the reverse, you have to feed your spirit, and the more you feed your spirit, the hungrier you become, and I think that’s what’s happening. People are feeding on God’s word, podcasts, SiriusXM radio, social media and everywhere you look on the internet, there’s music. There is so much going into the atmosphere that we have access to. It’s more accessible, and I think people are feeding on it and it’s creating more of a hunger for The Spirit. That’s what I love. I think we’re living in the greatest era in the history of the world for the church. Christopher Heron: You released two new songs, He Has Won and Fearless. How excited are you and what was the thought process? Martha Munizzi: I’m very excited but I’m putting it in God’s hands. I’m just going on with the assignment on my life. I believe people are going to be blessed by the music. I think it’s fresh and different. I think it’s going to be something that will bring a new worship experience. It’s still the same declaration and scripture and revelation but it’s a little different so I think people will be surprised but hopefully, pleasantly. Christopher Heron: At this stage, as an artist and worship leader, what is your mindset and objective? Martha Munizzi: I’m older, a little bit wiser, and my goal is to have music for my church. My daughters helped me write songs, my son plays the guitar and drums, so I’m preparing them for their next season, setting my kids up to win because I believe that’s what it’s all about. The focus is not on me like it used to be. What I’ve been doing for the last 6 years is raising my kids, and I’ve been pointing the way for them, and now here they are. I think it’s inspiring for people to see the next generation. And that’s what’s so exciting to me.